Tension gripped the Nehru Nagar area following the demolition of a house of some migrants by a local resident in the morning here today. 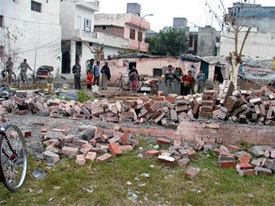 The migrants, who had been staying in the house for the past many years, alleged their house was demolished by a resident of Bal Singh Nagar, who was eyeing the prime land. Having failed to win confidence of the majority of councillors, the chief of the local civic body will have to face another no-confidence motion soon. The decision to move such a motion was taken at a meeting of 11 councillors led by leaders of the opposition at the council office on Wednesday. Potholed roads, garzbage littered on vacant plots, bad condition of public parks and pigs are the problems being faced by residents of the local Sector 32-A colony, developed by PUDA. 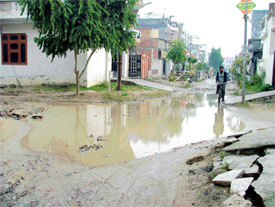 The residents are up in arms against PUDA for not providing them with basic civic amenities. The victims of the 1984 anti-Sikh riots today deplored the attempts of the Union Home Ministry to “hush up” the findings of the Justice Nanavati Commission, which submitted its report to the Union Home Minister, Mr Shiv Raj Patil, yesterday. Punjab Education Minister Harnam Dass Johar today directed officials of various departments to strictly implement the decisions taken on public complaints within a fixed time frame and warned that any kind of laxity in grievance redressal would be taken seriously. 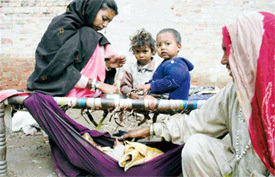 Making clear their intention to wage a decisive battle against the Congress Government in Punjab for its anti-trade policies, in general and its attempt to push through value added tax (VAT) in the state from April 1 in particular, the Punjab Pradesh Beopar Mandal has announced its total support to a call given for ‘Bharat bandh’ on February 21 by the Akhil Bhartiya Udyog Vyapar Mandal (ABUVM). The Deputy Commissioner, Mr Anurag Verma, today asked the officials of the district to gear up for fifth economic census to be conducted in April and May this year. He was addressing a meeting of the officials concerned today. The Bahujan Samaj Party (BSP) will stage a demonstration on February 14 in front of the Deputy Commissioner’s office in Jalandhar against the alleged atrocities being committed on Dalits in Punjab. Stating this here today, the state president of the BSP, Mr Avtar Singh Karimpuri, alleged that the state government had failed to provide relief or justice to the victims. Led by the Uttariya Railway Mazdoor Union (URMU), the railway employees today held a gate rally at the diesel shed here to protest against the alleged anti-labour policies of the government and voice their demands. From obscurity to fame. His graph to fame has been of short duration, but very sharp and swift. The person in question is Ravinder Ravi. 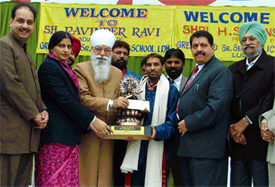 In the Indian Idol contest being telecast by Sony, Ravinder Ravi, a painter by profession, ascended heights of popularity. 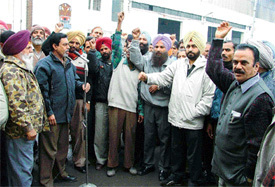 Activists of Punjab Subordinate Services Federation and Punjab and Union Territory Employees Action Committee today held a protest show against the privatisation policy of the state government outside the office of Deputy Commissioner here. The Punjab State Human Rights Commission (PHRC), has urged the state government to include human rights as a compulsory subject in the curriculum of the Punjab Police Academy, Phillaur, so as to sensitise the policemen. An executive body meeting of the Dhan Pothohar Brotherhood, Punjab, was held at the Punjabi Bhavan here today. The meeting was presided over by its president, Mr N.S. Nanda. The Khanna police has seized 18 kg of poppy husk and 10 bottles of liquor from two different places and arrested two persons. According to information, ASI Malkit Singh nabbed a person during patrolling from Bhamdi village and recovered 18 kg of poppy husk from him. In another incident,the Payal police arrested Chanan Ram,a resident of Jarg, at a special naka near the Jandali canal bridge. Shivalikwala Doon School arranged a party here today to bid farewell to outgoing students of Classes X and XII. The party was arranged at a resort. The 10th International CME (Continuing Medical Education) on Pathology got under way at Dayanand Medical and Hospital (DMCH) here today amidst a galaxy of noted pathologists and medical experts from India, USA, Canada and West Indies. Manpreet Kaur, a student of MA (English), stole limelight on the opening day of the 44th annual athletics meet of the Khalsa College for Women, Civil Lines, here today. Manpreet Kaur bagged four titles (50 m, 100 m, long jump and high jump) to prove her mettle.